I never contemplated writing a story until I had one to tell. This happened about eight years ago when a windfall of scientific data landed on my lap. Privy to a big, big story—a secret I thought the world should know—I felt compelled to write the story. The book title changed four times and my research and edits were endless. 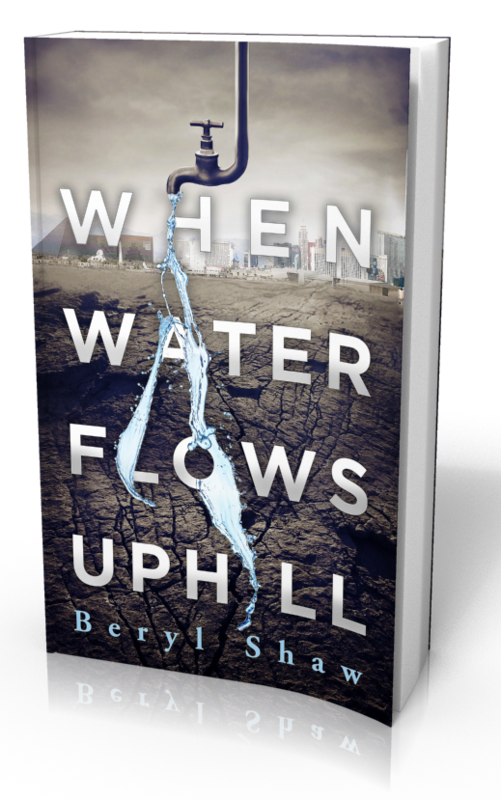 Then one day I removed 300 pages and completed my novel, “When Water Flows Uphill”. I’m currently working on my next novel, a period piece that takes place when life seemed grander and dreamier than now. Symbolically speaking, skies back then were vivid blue instead of dull gray. The story itself I haven’t quite found, so I’m familiarizing myself with the characters as the plot moves on. To write, I must be alone. And it helps to be in a space of my own. Then I become absorbed while hours pass like minutes. On the first try, my sentences never come out right—but at least my ideas get written down. When I edit, I’m tough. No matter how much I love a passage, if it doesn’t work, it’s out. “Tomorrow is a new day” is a slogan by which I write and live. If my brain is clogged today, there is a good chance that tomorrow it won’t be. In the meantime, I jot down notes: thoughts I find interesting or worthy of exploring. I also read, and I’m not a fan of action-packed, non-stop chase scenes that become the entire story. Equally so, I’m not impressed by authors who insert every word they know. “Look at what I can do” only turns me off. When I read a novel, I want to fantasize, I want to feel, I want to learn, I want to be seduced to the point that I can’t let the book out of my sight. I also subscribe to lots of magazines: “Vogue”, “W Magazine”, “PAPER New York”, “Rolling Stone”, “Harper’s Bazaar”, “Architectural Digest”. In magazines some of the best writing can be found. My mother majored in journalism, and I think her love of good reporting rubbed off on me. Nothing grabs hold like a great editorial, a colorful cover story, an editor’s letter that inspires a read from cover to cover. I may be missing out on a lot of things, but writing now bears my name. For me, it’s a wonderful obsession that brings serenity and obliterates the troubles I have. It’s a contest. It’s an opportunity each day, a chance to outshine what I wrote yesterday. However, I must be mindful, for with writing comes the caution not to look up one day and be startled by my age.